The best part of winter camps is that the cold, windy, rainy,snowy conditions brings out the goalkeepers who are truly committed! The kids who come out are soccer junkies, passionate about the position, and willing to do whatever it takes to be their best self! Any student who is willing to train in those conditions motivates me to join them! I loved seeing familiar faces and also welcoming new students into the Dynasty family. Lastly, thanks to our staff and all the parents for your hard work and support this winter, without your help I wouldn’t be able to pull off these camps. 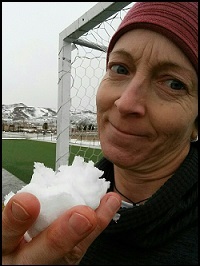 From moving goals, running warm-ups, sweeping snow off the field, driving students countless hours to get to training, fetching balls, gathering gear, and most important of all LOTS of smiles and laughter…I would be lost and miserable without all my helpers! So thanks again to everyone involved with the 2017-18 Dynasty Winter Camps. I am looking forward to next year already! Dates and locations will be posted online around October 1st!. Former Dynasty student and UConn women’s soccer goalkeeper Emily Armstrong has signed with Icelandic soccer club IBV for the 2018 season in the Úrvalsdeild kvenna, Iceland’s top women’s soccer league. You can follow Emily’s pro adventure abroad on her blog and check out last season’s highlights from her 10 games with Medkila IL. Longtime Dynasty student and staff coach (2013) Caroline Casey enters into her third season as a professional for NWSL club Sky Blue FC. Caroline started attending Dynasty at age 13 and returned every summer through her sophomore season at William & Mary when she transitioned onto staff. 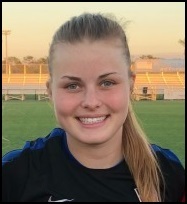 Drafted to SkyBlue in 2016 she is currently competing for playing time versus Canadian National team goalkeeper Kailen Sheridan. Dynasty fitness legend Britt Eckerstrom is entering into her 3rd season as a NWSL pro with the Portland Thorns. Eckerstrom committed her winter off-season to gaining much needed match experience playing with the Newcastle Jets in Australia’s top women’s league helping them advance to the league semi-finals (a club best!). She came into pre-season sharp and continues pushing Thorns 2017 NWSL MVP Goalkeeper AD Franch hoping to work her way into the starting line-up. A new DGK Pro Blog by Britt will be posted soon, so stay tuned! Former Dynasty student and staff coach (2010) Adelaide Gay continues to hone her craft and work her way around the globe playing professionally. NWSL Seattle Reign FC recently signed Gay as a National Team Replacement Player. Gay will remain on the Reign FC roster while goalkeeper Lydia Williams is away with the Australian National Team. Gay most recently played for Íþróttabandalag Vestmannaeyja (IBV) in Iceland; prior to that she played in Sweden with Kvarnsvedens IK. Gay attended the University of North Carolina where she helped the Tar Heels win their 21st national championship in 2012. While at North Carolina, Gay was an All-ACC Academic Team selection. In 2013, the Portland Thorns signed Gay as a discovery player. She has also spent time with the Washington Spirit in 2014. National Team Replacement players can be signed when a National Team Player is away on international duty and will not count against the team’s 20-player roster limit. Former Dynasty staff coach (2006-2008) and University of North Carolina graduate (2009) Ashlyn Harris continues to add to her lengthy professional career entering into her 9th season as a professional having played in the WPS (Saint Louis Athletica, Washington Freedom, Western NY Flash), Germany (FCR 2001 Duisburg), Sweden (Tyreso FF) and now in the NWSL (Washington Spirit & Orlando Pride) as well as with the US Women’s National Team (15 caps). This will be her third season starting for the NWSL Orlando Pride. University of Michigan graduate and longtime Dynasty student Megan “Stu” Hinz will make her professional debut in Sweden this spring. She is starting off with Gustaf Goif a 3rd tier team (1st division is the third tier in Sweden) hoping to be able to showcase her talent and worth, opening up more options work to play on a higher division team. KELSEY WYS – Spring 2018 – Washington D.C.
Dynasty alum and Florida State graduate (2013), Kelsey Wys enters her 5th season as a professional in the NWSL. Drafted in 2014 by the Western NY Flash, then traded to Washington Spirit ahead of the 2015 season. Wys is working to earn playing time and regain her starting spot with the Spirit after missing the entire 2017 season recovering from an ACL injury sustained while playing in Australia in the off-season prior to the 2017 season. After three seasons in the NWSL (Seattle Reign, Sky Blue FC & Orlando Pride) as a reserve goalkeeper Caroline Stanley made the reluctant decision that it was time to move on with her career. A University of Southern California graduate, Stanley retired from competitive play and is eager to give back to the next generation of player as an assistant coach at Tulsa University! Caroline is a longtime Dynasty student and staff coach (2014) who we hope will be able to join us on staff again soon now that she is done playing. Congratulations to Indiana University sophomore Bethany Kopel on her first call up with the U19 US Women’s National Team for training camp in Lakewood Ranch, FL. Congratulations to Angelina on being named to the U17 US Women’s National Team roster for the upcoming 2018 CONCACAF U-17 Women’s Championship to be held in Managua, Nicaragua from April 19-29. Angelina has worked hard to impress the coaches and maintain her position in the past year, having only been called into her first training camp in May of 2017! Three teams will qualify out of CONCACAF for the 2018 FIFA U-17 Women’s World Cup in Uruguay on November 13 – December 1, 2018. Good luck in the upcoming tournament Angelina! 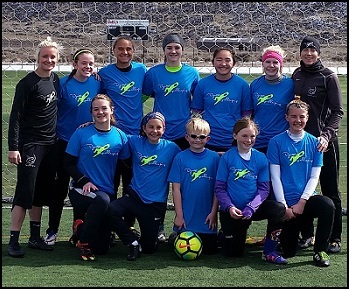 Congratulations to Dynasty student Kat Asman (NTH Tophat) on another call up with the U18 US Women’s National Team for training camp in Lakewood Ranch, FL. Kat has been a consistent member of the U.S. Youth National Team pool since age 13! IMPRESSIVE! 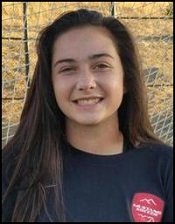 Congratulations to Leah Freeman on another invite into training camp with the U16 US Women’s National Team in Carson, CA.